you’re awesome… and i’m glad you had a fab time. Awseome photos. Any chance I could get a print of a couple??? Would love to put them on my wall to provide a little renewal in between Burns. 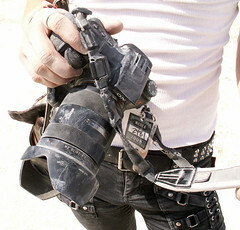 Great blog – I want to go next year — how did you protect your camera from all that sand? Thank you sir! It’s quite an experience. I like you a lot and your pictures rock! Thanks so much for the insight into your version of the 2008 Burn. p.s. can I come cook grilled cheese sandwiches this year?! This selection of images really captures the amazing feel of Burning Man 2008. The KKK image of the white man kissing the black person tells so much it could be an icon of USA history. Thank you so much for sharing these great works of art!